Clean & comfortable remodeled home in quiet Peter Pan neighborhood. Home sits on a fenced corner lot with fruit trees and has awesome curb appeal. Side yard has plenty of room for boat or RV storage. New paint inside and out, new fencing, 3-year old roof, new central forced air furnace, recessed lighting. Master suite on main level has new bathroom with jetted tub, shower, and cool barn door. Huge bedrooms upstairs, one with walk-in closet that is currently being used as extra sleeping space. Cute snowboarding bear mural. Full bath upstairs with dual vanity. Cozy and efficient wood burning stove. Kitchen features a breakfast bar and new stainless appliances. Inviting outdoor entertainment area, covered back patio, BBQ island w/fireplace, pond/fountain, decorative lighting. Shed in backyard has new roof, windows, insulation, and electricity, currently used as a ski waxing workshop. Large 2-car garage w/high ceilings. Would make a wonderful full-time residence or family mountain getaway. 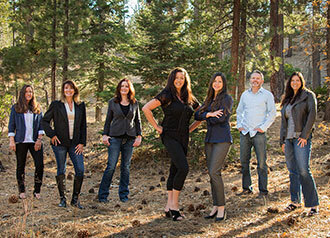 Click here to view all homes for sale in Big Bear City.
" Emily Cartwright was wonderful to work with. She was helpful as we learned more about Big Bear, determined the right neighborhood for us, and … continued	"